the pool was amazing. the water was perfect. I didn't do much else but it would've been nice to use the hot tub inside on the day it rained. I didn't realize it would cost an additional $50 as its considered part of the spa. nonetheless, the staff was great and the views were nice. Great room, location, bar, service. Highly recommend. Location to 6th street was important to me. Also, there were several very good restaurants within easy walking distance from the hotel so once you park at the end of the day you are set for the evening. How close are you to everything, we were there for the Moto GP and it was even not far to COTA. The pool area looked very enjoyable but it was too cold when I was there to get the real experience. Commonly thought of as the coolest city in Texas, Austin is a cultural nexus of music, art and entertainment. No matter if you're headed to the Texan capital for a corporate convention, the SXSW arts festival, or just to check out the horizon from the Ann W. Richards Congress Avenue Bridge, you won't want to miss out on Austin's killer shopping destinations, eclectic cuisine and abundant outdoor spaces. Austin is located on the edge of the Colorado River, with an array of water-based attractions both natural and man-made. Lake Austin is where to head to hook a catfish or largemouth bass, while you can swim in the midst of popular hiker's spot Zilker Park at Barton Springs Pool. Tackle the bike trails on shore around neighboring Lady Bird Lake, or get out on the water with a canoe or kayak rental. Offering the best views of greater Austin from its summit, make time in your sightseeing schedule for a Mount Bonnell hike. Located on the edge of Covert Park on the Colorado, Mount Bonnell spans more than five acres and is 780 feet above sea level. A long staircase takes you to the top, where you'll find stone picnic tables and a 360° sweep of Colorado scenery to accompany your lunch. If you're a blues music fan, cross the 1st Street Bridge from SoCo and head into Butler Park. Besides being an optimal place to take in the awe-inspiring Austin skyline, you can also visit the bronze memorial of legendary guitarist Stevie Ray Vaughn, who called Austin home for many years. Other talking points in this area include the Ann W. Richards Congress Avenue Bridge, home to the largest urban population of Mexican free-tailed bats in the world—visit at dusk on spring evenings to witness them taking to the skies. The most obvious place to stay when you're here for a city break, you'll find a variety of accommodations Downtown that offer easy access to I-35 and Downtown Station. To the north of the center is the University of Texas campus and the Texas Memorial Museum, as well as the quietly removed, verdant district known as Hyde Park. Nightly rates for staying in the thick of it typically begin at about $89, and visitors looking for 4-star accommodations can expect prices starting at around $139. You may have heard Austin's motto, “Keep Austin Weird,” but it's more than just a catchphrase. Find the unique artsy pulse of Austin in South Congress, commonly known as SoCo, is the epicenter of Austin's of diverse shopping, bars, restaurants and unobstructed views of the Texas State Capitol building. It's also where you'll find the shrunken heads and other oddities of aptly-named Museum of the Weird on 6th Street—the embodiment of Austin culture. Every March, Austin hosts the interactive South by Southwest music and film festival. The nine-day, world-class event features keynote addresses on a range of subjects, comedy performances, film screenings and awards. SXSW events take place at the Austin Convention Center and a variety of other venues throughout greater Austin. If you're a sports fan, don't miss SXSW's traditional farewell event, the South by Southwest Closing Barbecue and Softball Tournament. Spring is clearly the time to come to Austin, when you can also get down to the roots of Texas musical heritage and find the best in bluegrass, jazz and blues in Old Settler's Park every April. There's plenty here for family audiences, including storytelling and a petting zoo on-site, but adults can still drink their fill of craft beers and even jam with a few of the musicians if they're lucky. Austin is served by Amtrak's Texas Eagle line and the Austin-Bergstrom International Airport (AUS). 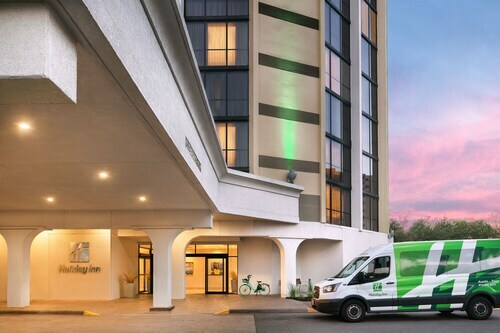 Instead of dealing with the hassle and costs often associated with downtown parking, reach Austin hotels by hopping on the MetroAirport bus on the lower level. The bus ride, which stops at the Capitol, the University of Texas, downtown and along Riverside Drive, takes about 30 minutes. Staff was really nice and helpful. Our room was very clean.